Multi Domain Website- As such this is the biggest job search engine; it is having multiple domains country/Region wise. Each domain jobs data is managed individually from their individual admin area. Multi Language Website – Multi-lingual search engine. Website language is being managed domain wise.User can create a new account or login into the website or facebook account. After login, user can save job, save job alert, add tags in the job, send email to friends etc on this website. 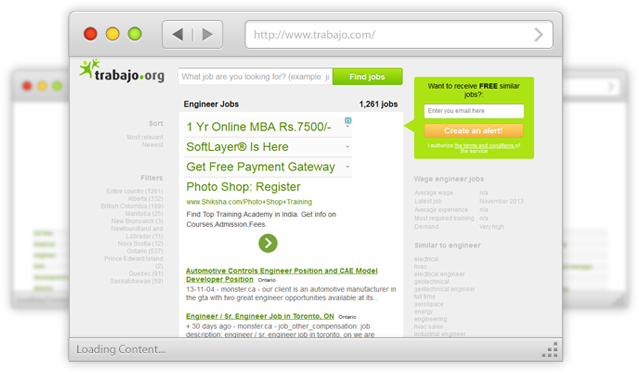 Job Search Engine: Trabajo.org is a job portal. Administrator can crawl other job portals and crawler script can crawl all the data for other websites. Such as Job Title, Job Description, Job Details etc.